Ohhhhh wow it been a long time since I wrote anything, it's mostly because I moved in January and haven't had internet since then... It only got installed on Friday. So here I am writing again, while I have not have internet I've mostly been gaming and making Cosplay so the usual. So this was very stressful as you can imagine and without internet or T.V for a while I went a bit stir crazy for a while but I did manage to make my house just the way I wanted it. I now have a craft room for all my cosplay needs, a game room for all my gaming needs, a big kitchen and living area for all my normal needs and lastly I set up my display case... Full of all my nerd and I love it. 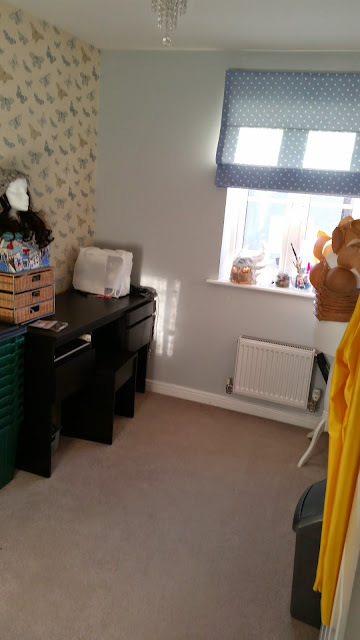 Its just a small room which is mostly a mess as I'm constantly working in there and I do feel i should tidy it until I've finished what I'm currently doing. Here it is when it was clean.